Do you have to turn on the hot faucet for a while before the hot water actually gets there? Save that water and use it for something else! In the kitchen, I keep a couple of attractive water pitchers on the counter. (Rinsed gallon milk jugs work, too.) As you run the (not-yet-)hot water, collect it in the jugs. Later, pour that water into pots and other dishes that need to soak. Use it to rinse the sink. Water some plants. And so on. Find a watering pot (for flowers), and other containers that hold water for everyday uses, that are the right sizes to fit under the tap. When you run the water from one of those faucets, fill the container. Then take it to the part of the house where you need to use the water. 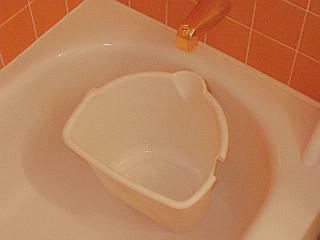 And see the tip about the bucket in the bathtub, below. Most handles "catch" at some place, where you don't have to hold them down anymore and the whole tank will empty. You need to train your hand to feel for this "catch" place as you start to push down the handle -- and not let the handle move that far. Press the handle enough to let water out but not to "catch". When there's anything but toilet paper to flush, though, this system may not be good at clearing solids out of the bowl. It works okay on mine, though, with a nearly-full bucket. I (carefully) dump just a quarter of it to get things moving, then wait and do a long pour as the bowl has almost cleared; I leave a bit to swish around any non-bare edges of the bowl. This uses a lot less water than flushing from the tank: one or two gallons instead of four! The water level in the bowl stays lower (because the bowl doesn't refill, because the tank doesn't refill), but that's no problem. If I need to run hot water in the washbasin (to wash my hands, for instance), I run the "not-hot" water into the bucket in the tub. Once the water from the tub faucet begins to get warm, I turn it off and turn on the hot faucet in the basin. I don't let the water in the bucket get too hot; I'm afraid it isn't good for the toilet (though I'm not sure). Or, if I won't be needing hot water in the washbasin, I fill the bucket from the cold tap. If I don't already have water in the bucket from an earlier handwashing, I start the bucket filling as I start to use the toilet. That saves a bit of time later. Maybe you don't need to flush toilet paper? In some places around the world, you'll find a wastebasket next to the toilet for the T.P. If the paper has just a bit of liquid on it, it probably won't need much ventilation if you just toss it in the trash. Doing that, instead of trying to flush it out of the bowl, could save a lot of water. Consider not flushing without a "solid reason." If your bathroom gets some ventilation, simply close the toilet lid and wait to flush until you really need to. (When guests come by, tell them about your system... or just flush ahead of time.) A quick swab with a bowl brush after flushing keeps the bowl tidy. Finally, you can read about another way to avoid flushing in a book written by a friend of a friend, Liquid Gold, the Lore & Logic of Using Urine to Grow Plants. I actually haven't read it (and I don't have a garden where I can use the ideas), but the friend who recommended it is very smart. ;-). My hot water heater is well-insulated, and I don't use much hot water. It burns natural gas. I've found that I can leave its pilot light on and, for most of the time, that gives water that's warm enough for washing hands and etc. When I need really hot water, I turn on the main burner and let it come up to high temperature. Thanks to this, my monthly natural gas bill is often under US$10. 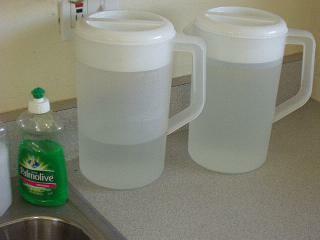 After each meal, I use water from my jugs (see tip above), with a little liquid soap, to rinse food off the dishes. Start by rinsing a big bowl or pan, then use the water from that to pour on other smaller dishes, and so on; that way, the water from the first pot or bowl will rinse most of the dishes. Finish by rinsing the plates with more water from the jugs. Turn everything sideways or upside-down in the sink to let it dry, then stack it all until wash day. (I have a cupboard shelf where I keep my ready-to-wash dishes.) Now your dishes won't attract bugs, and they only need a quick "real" washing to sanitize them. On wash day, I put a big pot of water on the stove and heat it to boiling. (I don't even need my hot water heater on; see the tip above.) I wash the stacks of dishes — which is easy and quick because they were pre-washed and stacked! By the time the pot of water is boiling, I've got stacks of dishes ready to rinse. I leave fragile wine glasses and etc. for last, when the boiling water has cooled some; this might be less of a shock to them than suddenly being plunged in very hot water. If you have fine glassware or china, be careful about this. When I worked in a restaurant dishroom, state law said that water had to be at least 165 degrees F to kill germs. Boiling water is at 200 degrees or so. Most peoples' water heaters aren't this hot! So I believe this system is actually healthier than rinsing in the lukewarm water that comes out of many peoples' water heaters. I have quite a few dishes, so this system also saves water because I only need to wash dishes once a week or so. The dishes are already basically clean, so the wash water doesn't need changing. I use just two dishpans of water (one wash, one rinse) per week. I've got a garbage disposal in my kitchen sink, but I don't use it much. It seems wrong to me to use lots of water to flush garbage down the drain. Instead, I do what people without disposals do: put the garbage in the garbage can. If the garbage is wet and your sink has strainers in the bottom, let the liquid run down the drain before you toss out the solid stuff. Ditto with coffee in a filter: let the grounds drain a bit before you toss them out. The picture at the right shows a simple plastic strainer disc, with a handle, that fits into the top of the disposal. It catches food but lets liquid through. You can take it out if you need to use the disposal. I bought it at a local kitchen-gadget store. 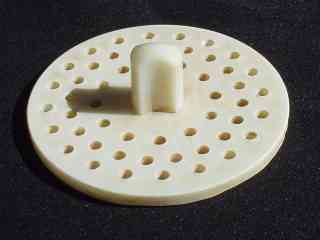 My mother used to have a triangle-shaped plastic box, with a drain in the bottom, that sat in one corner of the sink. (It was one of those things Rubbermaid would have sold.) She could toss garbage in it, then take the drained scraps to the garbage can or compost heap. Use old plastic containers (from yogurt or cottage cheese, for instance) to hold the vegetable scraps and other not-too-disgusting ;-) garbage. Keep the containers in your fridge for a couple of days; because the lids are sealed tight and the fridge is cold, the garbage won't rot or smell. When it's time to take out the garbage, empty the plastic containers into the garbage can and rinse them out with some soap and water from your jugs (see above). Use water from one of your jugs (see note above) as you run the disposal. Once I used my disposal so little that it "froze": turning on the switch just made it buzz and get hot without spinning. After I broke it loose (by using a hex wrench to turn the disposal innards manually), I've tried to run it at least once a month. On my first trip to France many years ago, I visited a home in the Pyrenees. Their bathroom had a washbasin (sink) with hot and cold faucets, as I was used to. But it also had a foot pedal on the floor. The water ran only when I turned on the faucet and put my foot on the pedal. This simple system made it easy to save water. The faucets stay on, set to give the temperature of water you want... and the water runs only when you press the footpedal. Your hands are free for washing your face, shaving, or whatever. When people send me their ideas for saving water, I'll add them here. Joseph Rene DuPont is creative! He uses a pump-type tree sprayer -- with a tank that holds two or three gallons -- to wash dishes. He uses two -- one with soapy water, one with clean -- to shower. They save money for washing cars (go to a car wash to rinse/wax). Spray-paint them flat black to heat them in the sun -- though the pressure rating is reduced when heated. The pressure helps to clean, and the squeeze-type trigger makes it easy to shut off to save water. Joe used a plywood cover with a hole in it, and a vacuum cleaner blower, to flush a toilet using air. (He had a holding tank for sewage, so he only needed enough water to re-fill the trap.) Joe hopes to use foot switches to control electric water pumps.